Video clip synopsis – In 1963 the Aboriginal Elders at Yirrkala presented the Federal Government with a bark painting, the title deed to their country. Broadband MP4 indibark_bb.mp4 (10.2MB), suitable for iPods and computer downloads. The European colonisation of Australia has had many impacts on Aboriginal and Torres Strait Islander Australians. Many meetings between European and Aboriginal cultures were unsuccessful: Aboriginal disenfranchisement and the effects of white society resulted in inequalities and tensions. By as early as 1869 the colonies began to remove Aboriginal children from their families in an effort to assimilate them and ‘protect’ them. 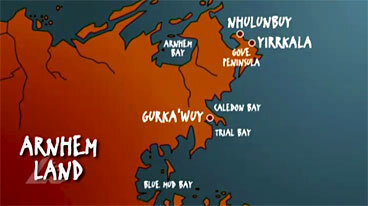 On a map, locate the Gove peninsula. Discuss: do you think petitions are a powerful way of making your opinions heard by government? What other ways can you voice your opinion? What do you think is the most effective way of making your voice heard? Investigate and discuss: what is a title deed? When was the bark petition produced? Why did the Yirrkala men construct the petition? What messages did they want to convey to the government? Franchesca Cubillo says that the bark petition is like ‘title deed’. Why do you think the petition was not recognised by the then Menzies Commonwealth Government? Do you think this was reasonable? Share your thoughts and planning process with someone and write at least 100 words for your answer. Research the bark petition (see link below) and find out the actual English wording of the document. Create a timeline that marks important moments in indigenous civil rights history between 1966 and 1998.